HOUGHTON – Despite playing well and even holding a two goal lead, the Lake Superior State Lakers were unable to end their winless streak against the Michigan Tech Huskies, as the teams skated to a 3-3 tie. The last time Lake Superior defeated Michigan Tech was January, 2014. They have gone 0-10-3 since, plus 2 losses in the WCHA tournament. Lake Superior (4-12-4, 3-8-3 WCHA) opened the scoring from an unlikely source, as Brendan McKay earned his first collegiate goal. The redshirt sophomore from Toronto beat Huskies netminder Robert Beydoun, ending the scoring drought for the Lakers. 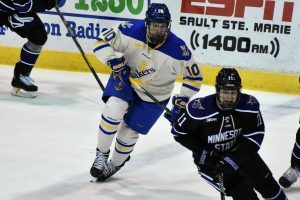 Prior to the goal by McKay, the Lakers had not scored since Hampus Erikkson potted the only goal in their series against Minnesota State last weekend – eight periods plus change. Despite the Huskies (9-7-5, 7-6-5-2 WCHA) outshooting the Lakers 12-6 in the first period, Lake Superior took a lead back to the locker room after 20 minutes. Midway through the second period, J.T. Henke added to the lead with a goal directly off the faceoff. Henke (6-15-21) entered the game in a tie for 26th in the nation in scoring. His 16 points in conference play have him among the scoring leaders in the WCHA. Dylan Steman helped get his club back into the game 1:35 later as his second goal of the year cut the Lakers’ lead in half. Lake Superior appeared to get themselves into big trouble when Gage Torrel was called for contact to the head late in the second period. Torrel received a five minute major plus a game misconduct. Just over a minute into the penalty kill, Tech’s Jake Jackson was sent to the box for interference, helping negate some of the penalty time. Unfortunately for Lake State, Dane Birks knotted the score at 2 goals apiece. The Huskies took the lead with just over four minutes to play with a goal from Brent Baltus. Making matters worse for Lake Superior was a tripping penalty issued to Mareks Mitens, making the chances for a Laker comeback less likely. Despite the odds, the Lakers continued to press. With an extra skater on the ice, Anthony Nellis cashed in for his seventh goal of the season with just 42 seconds remaining in regulation. Just like they did in their series back in October, neither team could end the game in the 5 on 5 or 3 on 3 sessions, sending the game to a shootout. In the shootout, Lukas Kaelble and Henke had chances to win, as the Huskies missed on their opportunities. Unfortunately, they did the same. In the third round, Jackson beat Mitens with the puck and, coupled with Nellis failing to convert at the other end, enabled the Huskies to pick up 2 points on the night. Following the game, head coach Damon Whitten praised his team for holding things together in spite of the adversity the team played through, including the injuries the team has faced through the season. During the third period, Hampus Erikkson was forced to leave the game due to injury. In net, Mitens made 33 stops, while Beydoun came up with 22. Saves that are made in 3 on 3 overtime and shootouts are not counted towards official statistics. The Lakers are off until the Three Rivers Classic on December 29-30th. In the first game, they will take on Robert Morris. The Colonials (6-11-1, 6-7-1 Atlantic Hockey) are the tournament host. The winner of that game will play the winner of Providence (10-7-1, 6-4-1 Hockey East) and independent Arizona State (4-10-3), while the loser will face the loser of that game.